If there’s one thing most pet food manufacturers are good at, it’s marketing. They’ve done a remarkable job of making pet owners believe they hold the secret to what our dogs should be eating. They lead us to believe that their food contains 100% complete and balanced nutrition. That’s a misleading notion because there’s no way to determine what a complete and balanced diet is. If you’re nervous about feeding homemade dog food, even though you know it’s healthier, I want to help. Back in the 1980s, cat foods were thought to be complete and balanced. But they were missing an essential nutrient for cats: taurine. Nobody knew at the time that cats couldn’t manufacture their own taurine. As a result, cats began dying from a heart condition called cardiomyopathy. That was until 1987, when researchers discovered the omission and started putting taurine in cat food. Despite this small setback, pet food manufacturers (and the vets who sold this food in their clinics) soldiered on. They continued to carpet bomb pet owners with more clever marketing. They kept telling us that pet food held all the answers and that feeding homemade dog food was a dangerous and irresponsible path to take. And many of us believed them. And we’d hoped they’d learned the lesson. Clearly, it’s time for pet owners to call on plain old common sense and simple observation when it comes to choosing a diet for our dogs. 20 years after those cats died from deficiencies in pet foods, pets were harmed by food again. But this time it was thanks to an addition to the food, and it was on a much larger scale. This time it was melamine, an industrial chemical that a Chinese manufacturer was putting in their exported wheat gluten and premixes destined for North American pet foods. As many as 1 in 6 pets died after consuming those tainted pet foods. Dozens of foods were recalled in 2007, after killing as many as 1,950 cats and 2,200 dogs. But of course, those manufacturers bounced back. In fact, in 2012, the American Veterinary Medical Association (AVMA) officially discouraged the feeding of raw meats to cats and dogs due to the perceived risk of illness from pathogens. Yet at the same time the AVMA was busy protecting our dogs from the perils of raw foods, dogs began dying once again from fully cooked commercial foods. This time, chicken jerky imported from China killed nearly 400 dogs and over 2,200 more suffered debilitating illness. If you walk into a conventional vet today and say you want to feed raw homemade dog food, chances are you’ll hear all about the dangers of raw foods. At the same time you’ll hear about the benefits of the veterinary formula food. The food that’s sitting on the shelves in that clinic. Food that, incidentally, has been recalled because of harmful ingredients. Hopefully, as you consider their rant about the dangers of raw food, you’ll be thinking about all the pats who have been killed by tainted commercial pet food. Now let’s compare that to the number of cats and dogs killed by raw foods. Anybody care to guess the number? Because it seems nobody knows. Raw feeding isn’t as complicated as the vets and pet food manufacturers would have you believe. That’s a marketing ploy. The vets and their scientists can warn about the dangerous pathogens in raw food. They’ll tell you about the high protein content or the danger of ingesting bones. But what’s the body count? Given the anti-raw climate in the veterinary community, surely somebody’s keeping track of all the pets killed by raw diets? Or could it be that maybe, just maybe, raw diets aren’t that dangerous after all. Now, some people would smugly say that commercial pet foods have a lot of science and research behind them and raw foods don’t. And they would be right. But raw feeders don’t pay much attention to the hoopla because they see with their own eyes how much healthier and disease resistant their dogs are. Sometimes seeing is believing. For those of you who want the science behind raw feeding, ask yourself this: would you rather jump out of an airplane with a parachute or without? I’m sure you would choose the parachute option, but there isn’t one single scientific study proving that parachutes work. But we can clearly see that they do indeed work. Raw feeders apply the same logic. They see their friends’ conventionally raised dogs suffer diabetes, bloat, gastrointestinal problems, parasites and rotten teeth. And they don’t see the same problems in their own dogs. Common sense would tell them that their food is working and not that dangerous compared to the alternative. If you’re ready to move away from processed foods now, read on. So you’ve decided that you, not some corporate bigwig, are going to be the one in charge of choosing what your dog will eat. Well, welcome to our world! It’s nice here on the common sense side of the fence and while we don’t have cookies, we’re a friendly bunch and we’re here to help you. It’s important to feed your dog all the parts of an animal, not just meat and bones. To begin, raw feeding isn’t as complicated as the vets and pet food manufacturers would have you believe. That’s a marketing ploy. The sooner you rid yourself of the notion that feeding your dog requires a PhD in nutrition, the more clearly you’ll be able to think. Here are the basic and simple rules you need to follow if you want to feed your dog homemade dog food. Yes, we can use the word “about” here in the raw feeding world and it won’t do your dog any harm. And calcium and phosphorus aren’t fancy words to be feared. You can also feed whole fish, raw eggs with the shell on and green tripe. These superfoods all have the correct ratio of calcium to phosphorus. Don’t be fooled into thinking a meat and bone based diet is lacking in vitamins and minerals either. Meats contain all of the essential amino acids (the basic structural building blocks of proteins) your dog needs. And they do so in a ratio that’s ideal for their complete use. Meat also contains 12 of the 13 essential vitamins in large quantities. [Related] Want more on how to balance the calcium and phosphorus in your dog’s raw diet? Check this out. It’s important to feed your dog all the parts of an animal, not just meat and bones. The organs, also known as offal, are the most nutrient dense parts of the animal. Compared to regular cuts of muscle meat, organ meats are more densely packed with just about every nutrient including heavy doses of B vitamins such as B1, B2, B6, folic acid and vitamin B12. Organ meats are also loaded with minerals like phosphorus, iron, copper, magnesium and iodine, and provide the important fat soluble vitamins A, D, E and K. It’s important to note that animals raised outside on grass contain even higher levels of these essential nutrients than their grain fed counterparts. Liver is known to be one of the most concentrated sources of naturally occurring vitamin A of any food. [Related] Why You Need To Feed Your Dog Liver. Raw bones are soft enough to bend and digest easily. Vitamin A aids digestion, keeps the reproductive organs healthy, and is a powerful antioxidant. Liver also contains one of the best, most usable sources of iron. Iron is necessary for many functions in the body, including the formation of hemoglobin, brain development and function, regulation of body temperature, muscle activity and catecholamine metabolism, to name just a few. A lack of iron will have a direct effect on the immune system; it diminishes the number of T-cells and the production of antibodies. But don’t just feed liver. Other organs to consider include kidneys, lung, pancreas and ickier choices like eyeballs and brains. Tongue and heart are considered muscle meat, not organ meat, so throw them into your daily rotation. Feel free to feed other weird and wonderful things such as chicken feet, tracheas, tails, testicles and pizzles (if you have to ask what those are, you don’t want to know). Beef trachea, pig ears, chicken and turkey feet are loaded in natural chondroitin and glucosamine, which help to build healthy joints. Raw bones are soft enough to bend and digest easily. Cooking bones makes them sharp and dangerous. For optimal safety, meal times should also be supervised. [Related] Recreational Bones For Dogs. There’s no need to be a slave to raw feeding. 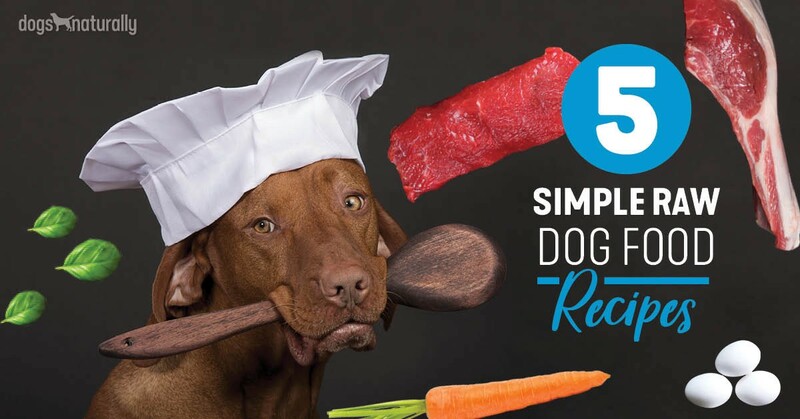 You don’t have to mix all of the above in the exact proportions and mince them into little complete and balanced patties so your dog has every nutrient, every day. In essence, what you want to do is a little technique called frankenprey. Over the course of a week or a few days, you want to assemble a complete animal, to make sure your dog gets the right proportions. Think of what a chicken or goat is made of, inside and out, and try to assemble that into your dog’s meals over several days, keeping the approximately same proportions of meat to bone and meat to organ meat. Now that is real balanced and complete nutrition for our carnivorous friends! [Related] [FREE VIDEOS] How To Start Feeding Your Dog A Fresh Raw Diet His Body Was Built To Eat. Are you nervous because there are no label instructions showing you how many cups to feed your dog? Start by feeding him about 2% of his body weight (if he’s a puppy, feed 2.5% of his expected adult weight). Now you’re going to put your common sense and good observation skills to work. If he starts looking plump, feed less. If he starts looking thin, feed more. It’s not really scientific but it works. Here is one last important note and this is what makes raw feeding really attractive for many people: we know where our dog food comes from. Whenever possible, try to get your dog’s meat from local producers instead of the grocery store. Try farmers’ markets, local butcher shops, farmers and co-ops. The closer you get to the meat producers, the more you’ll know about how those animals were treated. This applies to both the treatment of the meat as well as the ethics and sustainability behind the treatment of the animals themselves. Your dog isn’t a lab rat, he’s a dog and he counts for more than sterile numbers and calculations. If you can afford it, try to find organic, grass fed and pasture raised animals. Their meat will contain fewer toxins and will be more nutritious. If you can’t afford organic, try to find grass fed animals. If you can’t afford that, then you will still be better off than feeding most commercial kibbles so just find the best quality meat source you can afford and watch for sales on the grass fed and organic meats. All that hubbub about raw foods being dangerous is mostly aimed at you and me, not necessarily our dogs. Here is a common sense solution that will reduce the risk of meat borne pathogens wreaking havoc in your home: wash your hands and surfaces after feeding your dog. People have successfully managed raw meats in their homes for hundreds of years and we’re not going to suddenly stop practicing basic hygiene because our dogs eat raw food. Enough said. That’s really all there is to raw feeding. If you want to know more, there are lots of good holistic vets and books to help you fine tune your dog’s meals. We’ve invited you into our home, away from the hustle and bustle of the kibble marketing and science, and we raw feeders hope for the sake of your dog that you stay awhile. As you can see, it really isn’t that difficult and there are only a few basic guidelines you need to know to get started. If you’re still not ready to leave the comfort of commercial foods, you don’t have to. There are plenty of ethical and caring companies who prepare raw food on a large or small scale for your pet. Many of them were started not by large corporations, but by pet owners like us who just wanted better for their four legged family members. In the end, you can choose to feed your dog yourself or allow others to do it for you. If you let others choose what’s best for your dog, you don’t get to vote on what is more important: nutrition or profits. If you feed your dog yourself, his meals might not be what the scientists would have him eat. But your dog isn’t a lab rat, he’s a dog and he counts for more than sterile numbers and calculations. Stick with us and I guarantee there will be a moment in your near future when you know innately, deep down inside, that we raw feeders are right. That moment will be on a glorious sunny afternoon as you watch your dog in his shining coat and well tuned muscles tear into a delightful meaty bone; and you will both rejoice in the simplicity of a dog enjoying what nature intended him to do.